James Davidson was born in Newtown-Steward, Ireland in 1732. He was educated at the University of Glasgow and ordained to the ministry of the Presbyterian Church at an early age. After immigrating to Delaware in 1763 or 1764, Davidson was appointed principal of Newark Academy in Delaware, and pastor of two churches in that neighborhood. Davidson exhibited such evidence of his familiarity with the learned languages and of his abilities as a teacher in the superintendence of this academy that, on the death of John Beveridge, he was thought qualified to take his place at the College of Philadelphia. 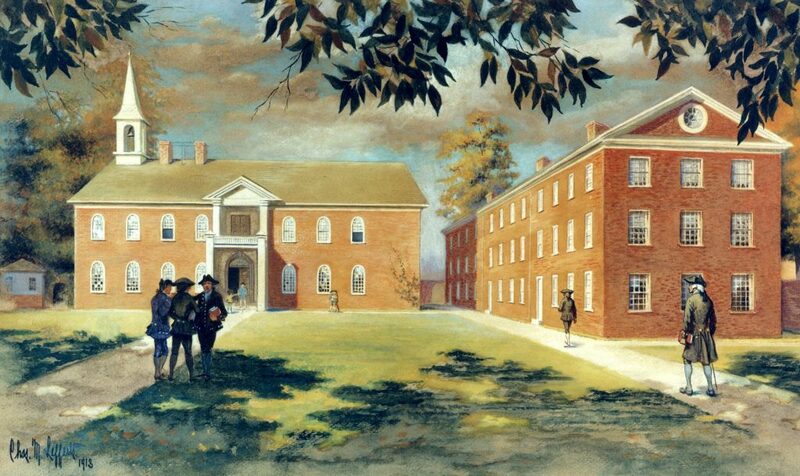 On March 8, 1778, Davidson was formally offered the professorship of humanity, and moved to Philadelphia to take the position. He remained there until the city was captured in 1778, at which time he fled with his family to Chester County. Upon the invitation of some of his former pupils, Davidson moved to Charleston, South Carolina to take charge of a large school. The taking of Charleston by the British in 1780 again forced him to leave, and after a short period, Davidson returned to Philadelphia. There he accepted the offer of the professorship of languages at the newly established University of the State of Pennsylvania, as the College of Philadelphia was renamed in its new charter from the new state government. Later in the 1780s, after the old Board of Trustees of the College of Philadelphia was successful in obtaining its own state charter and regaining control of the old Academy buildings, Davison resumed his professorship in that institution. After the University and College were united in 1791, Davidson was elected professor of languages in the resulting University of Pennsylvania. He received an honorary master’s degree in 1780, and served as the third rector of the Academy from 1780 to 1791. At the University, Davidson was known as a great reader who was accustomed to making notes in the margins of his books. His peers described him as “an honest man, a true friend of the Country, and a respectable citizen.” Since Davidson’s talents continued to be held in such high estimation, care was taken by the University to secure his services in each successive change of the institution. When Davidson was forced to resign in 1806 due to old age, the trustees, “in consideration of his long and faithful services,” provided him with an annuity of two hundred and fifty pounds per year and the use of a house for the remainder of his life. Davidson became a member of the American Philosophical Society in 1768. At one time, he preached in the First Presbyterian Church of Philadelphia, which he later left on account of some affront and joined the Protestant Episcopal Church. Davidson was an excellent linguist and published a Latin Grammar which was extensively used in the schools of Philadelphia for many years. Davidson died in Philadelphia in June of 1809, and was buried in the grounds of St. Peter’s Protestant Episcopal Church.